MFI Invests in Holophane’s Phuzion™ Highbay LED Lighting as part of its on-going commitment to its ISO 14001:2004 Environment Management System. MFI partnered with Parke County REMC located in Rockville, Indiana, and KirbyRisk Electrical Supply located in Crawfordsville, Indiana, to select the Holophane Phuzion™ Generic Highbay Luminaire for its Russellville, Indiana factory. Mr. Jeremy Montgomery of Parke Count REMC and Ms. Kathy Kelly of KibyRisk were instrumental in working with Diane Fordice, MFI Plant Manager, to secure a significant rebate from Parke County REMC’s PowerMoves program to help finance the lighting project. The result for MFI is a well-lit workplace that consumes less energy. MFI invests in a new Haas ST-20 CNC Lathe to increase its 3-shift production capacity. 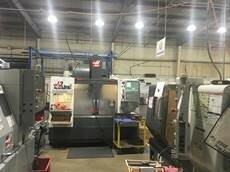 MFI partnered with Haas Factory Outlet, A Division of HFO Chicago, LLC and Machinery Finance Resources to select the latest CNC lathe and then finance the project. Mr. Coby Smith from Haas worked closely with MFI’s Chief Engineer, Mark Easterling to assure the ST-20 was the correct machine for our needs. 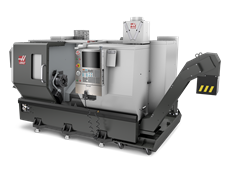 Once MFI selected the Haas lathe, Mr. Kevin Schaefer from Machinery Finance Resources worked closely with Haas to assure a smooth delivery of the machine. The addition of this fourth Haas CNC lathe will increase MFI’s turning production capacity by 33%. MFI continued the tradition of providing Thanksgiving Turkeys to the entire team. 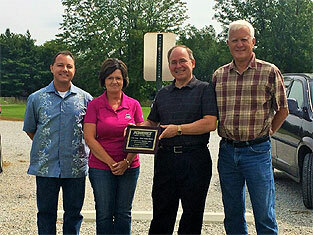 We are very thankful for the exceptional manufacturing group we have in Russellville, Indiana. Additional turkeys were donated to families in need around Putnam County, where MFI is located. MFI is proud to be a part of this Indiana community. Happy Holidays. Metal Forming Industries welcomed Jim Hess, a teacher at North Putnam High School, and his Advanced Manufacturing Students to our first event as a Conexus A+ Partner. Mr. Hess and his students visited our facility to observe today's modern manufacturing environment outside of the classroom. The Conexus A+ Partner Program is designed to team companies with 'Dream It. Do It.' Champion high schools in order to educate students, faculty, parents and communities about the value of a career in manufacturing. The second part of the site visit included a presentation discussing educational paths beyond the traditional university experience, including the explanation of many career options within the manufacturing segment, such as engineering, accounting, sales, management, etc. The final portion of the event included a question and answer session where students had access to Metal Forming Industries' President & CEO, Plant Manager, Customer Service Manager, and the Sales & Marketing Manager. MFI is committed to helping redevelop the manufacturing sector in the United States, through continuing education, advanced technology, and continuous improvement. If you have questions about this program, please contact Diane Fordice at 765-435-3091 or Jim Hess at 765-522-6282, ext. 498. 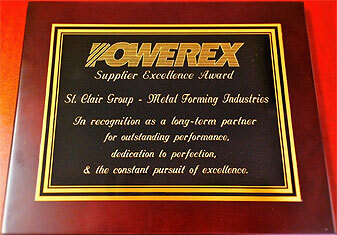 During the Open House celebration of the 2nd anniversary of the St. Clair Group acquisition of Metal Forming Industries, one of the company's largest clients honored us with a “Supplier Excellence Award”! Dave Penzera, with Powerex, made a 6-hour drive to our facility in Russellville, Indiana to present this award to Metal Forming Industries in person. This award demonstrates the strength of our long-term relationships with our clients and further emphasizes the importance of sustaining our continuous improvement program. In an address to all the Open House attendees, Penzera noted how pleased he was with our improvements, and explained his level of confidence in MFI as a globally capable supplier. He also noted that he was proud and honored to be able to deliver his message personally. This award is a testament to the hard work, investments and accomplishments achieved over the past 2 years. The St. Clair Group is committed to building a “Globally Competitive and Made in America” manufacturing base in Central Indiana. Pictured in the photo, from left to right, are Dave Penzera, Diane Fordice, Ron St. Clair and Pollard Staley. The St. Clair Group is committed to building a “Globally Competitive and Made in America” manufacturing base in Central Indiana. Metal Forming Industries is proud to announce that Bethany Wiatt, MFI intern and daughter of Cindy Wiatt (MFI Customer Service Manager), has been honored by the Greater Greencastle Chamber of Commerce as the Female Student Athlete of the Year. Bethany is being honored for her academic performance coupled with success in volleyball, basketball, and track over four years. Teachers Credit Union provided a $250.00 scholarship with this award. We congratulate Bethany Wiatt for graduating from high school with this honor, and we wish her the very best of luck as she starts her college career. In support of protecting our environment, one of Metal Forming Industries' top values, the Russellville, Indiana facility has become 1 of less than 6,000* firms nationwide whose Environmental Management System has been certified ISO 14001:2004. Our core beliefs are the building blocks for every strategy developed by MFI and that includes protecting our surroundings from harmful practices. ISO 14001:2004 is an international framework developed by committees, comprised of a variety of disciplines, from around the world. The system requirements include monitoring the impact of activities on the environment, demonstrating sound environmental principles, and regularly reviewing the environmental management practices in search of improvement. MFI is proud to join the majority of the 160 member countries of the ISO organization that have adopted ISO 14001:2004 as a national standard**. 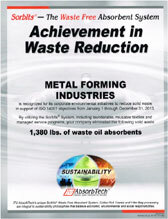 Metal Forming Industries has been recognized by AbsorbTech for one of its achievements in waste reduction. After converting to the SorbIts® waste free absorbent system, MFI has eliminated 1,380 lbs. of waste oil absorbents. This system combines launderable, reusable textiles and a managed service program to enhance our sustainability programs. Our intention to gain ISO 14001 certification is one of our major goals for 2014. Please visit our website often to track our progress. Metal Forming Industries elected Jason Nicolaou, Sales & Marketing Manager, to be part of the first Leadership Academy cohort developed by Heather Haas with Advisa in Carmel, Indiana, USA. 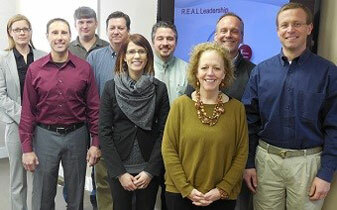 This program develops the people skills required to make the leap beyond a manager to a true leader. Metal Forming Industries has produced a professional video presentation that features the key capabilities of the company and shows off the recently upgraded facility. In just a few minutes, the viewer can take a virtual tour of the plant, from design, to all the major production operations (cold heading, progressive cold heading, impact extrusion, thread rolling, brazing & sintering, and CNC turning & milling), through quality control and testing. The Wingspan Care Group benefited from this event that utilized multiple social media channels to raise money for this not-for-profit organization that provides mental health care services to children, youth, and their families. Congratulations to Jason Nicolaou, who engaged with us on Facebook and YouTube on the 18th and was randomly drawn to win a Microsoft Surface! MFI receives the highest supplier quality rating from Microsemi Corporation for 2013. We look forward to continuing to provide high quality products to all of our customers. MFI combines cold forming and precision machining that delivered sustained customer material cost savings of 30% over the previous method. 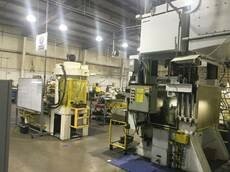 This U.S. manufacturer of industrial components reduced purchased costs from a total of $3.00 per part to $2.13 per part by using MFI's unique processes.